CCAPS Mascot for many years until he passed in 2014. Punk was a very loyal and loving dog. He would greet visitors at the front gate, take trips to visit school kids to help educate them on pet care & safety and attended numerous adoption events & festivals. He is greatly missed everyday ! Sweet Abby started her life off as a bait dog and then ended up in CCAPS, sadly, she spent seven years of her life with us. H & P Animal Alliance came to her rescue but unfortunately they found out that she had cancer. She was only given a couple months so her new H & P family started a Bucket List for her. She has had some Awesome adventures so far. It has been over a year now and Abby continues to beat the odds. This is one of the Best Cats ever ! Mama came to the shelter in 2013. At that time, she had a litter of kittens. Once she had weened her babies she started trying to help others with theirs. That started her new position as "Foster Mama" ! Whenever orphaned kittens were brought to the shelter, Mama happily took charge of them. She raised many kittens over nearly two years. We have retired her of her position now but still she cares for kittens by cleaning them and of course disciplining them ! 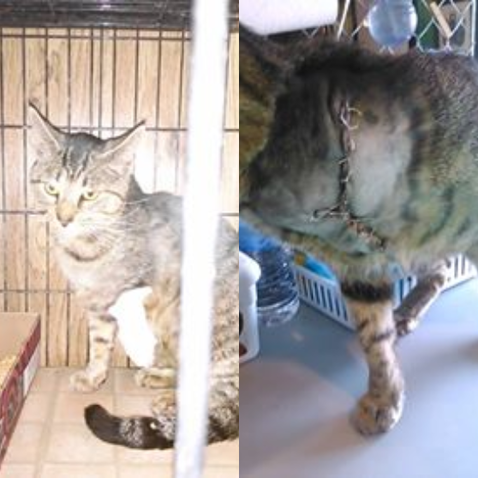 Jr was brought to the shelter missing half of his right front leg, all of our hearts ached for this poor boy who was just fighting for a second chance. Thanks to some wonderful donors, funds were raised to get this guy the help he needed. We took him straight to Franks Animal Hospital, where they diagnosed him as a very healthy boy, from there he was taken into surgery. This brave guy woke up happy and purring with his new family waiting for him ! Losing his leg has not held Jr back at all, he can still run and play with the best of them !